Full lace cap wigs that don't require the use of glue are often referred as "glueless" and if you'll indulge us for just we'd like to take a short detour before we get on to discussing what a "glueless" full lace wig actually is... Here at TCPG, we recognise that as of 2015, "glueless" is not a real word - go on, look it up and you'll find that it doesn't exist; it's not as though there are wigs that come with caps impregnated with glue and there are other wigs that don't, and it's not as though glue is the only way to bond a wig to skin - there's also a nifty invention called tape but the phrase "tapeless lace wigs" hasn't suddenly appeared...OK (rant) detour over, back to business. The term refers to a lace a wig that can be worn without adhesive (glue or tape) as historically lace wigs were always worn with the use of some form of wig adhesive. Additional combs or clips can be added for a more secure fitting. 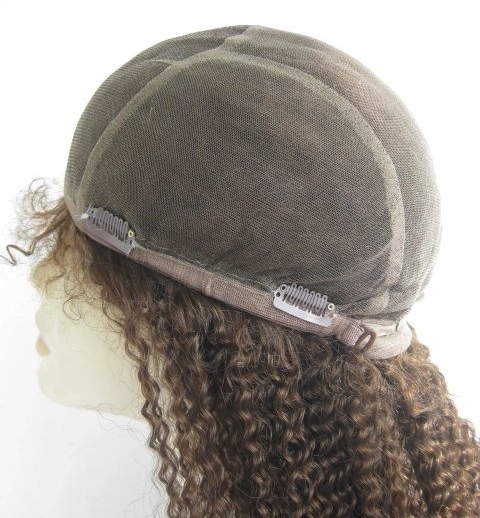 The adjustable straps can reduce the overall circumference by up to four centimetres (approximately 1.5 inches) so if your measurements are slightly smaller than the standard 22.5 inch full lace wig cap, then you'll be able to adjust it to make it smaller. The lace cap itself can be customised to include thin skin perimeters, stretch lace at the crown or a silk top - any stretch lace will always be a different colour to the lace because it contains elasticated material. 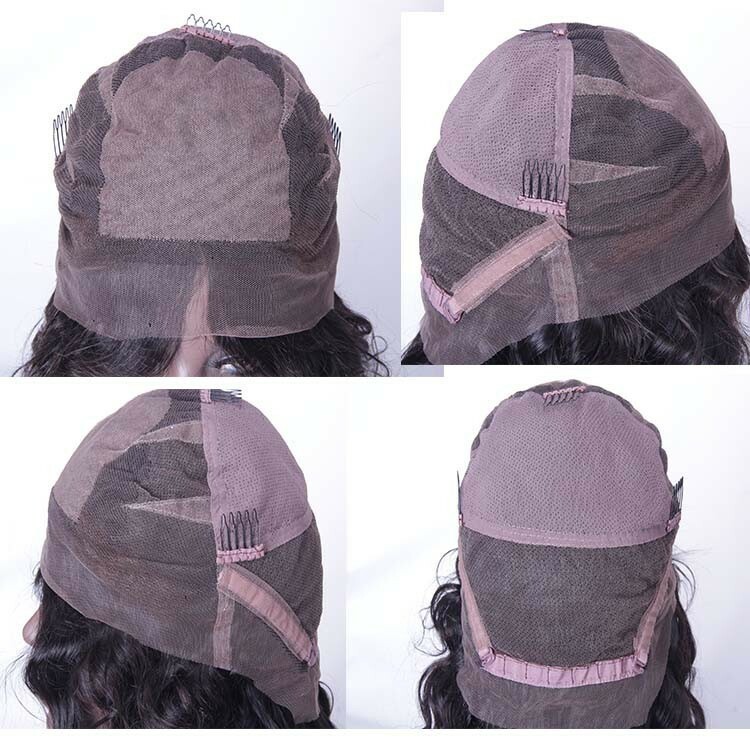 If you have significant or total hair loss and therefore cannot use the combs or clips, these can be removed or you can customise your order so that your full lace wig comes with adjustable straps but without combs and clips - in this instance a thin skin perimeter might be preferable as the PU strip can be worn without the need for adhesive - the seal it forms with the skin is not particularly breathable and if you're prone to oily skin or you perspire significantly then adhesive should be used. If stretch lace is added, the cap construction will afford an extra room and if this is important to you then ask your chosen retailer how much extra (if any) there is. If you're totally new to lace cap wigs and don't feel confident enough to go for this option, then starting with a lace front wig that doesn't require adhesive ("glueless"), or if you're allergic to adhesives or solvents or want a break from using them, then a "glueless" full lace wig is a great alternative. Another bonus to the Wear & Go full lace cap wig (yes, that's what we here at TCPG are have started saying instead of "glueless" full lace wigs) is that you can take it off daily to take care of your scalp or any growth hair. As adhesives are not used, it means that the hair cannot be worn in a high up-do as perimeter would lift up. However the TCPG top tip is to go for the fashionably tousled (or loose) ponytail so that some of the hair covers the hairline front of the lace wig is not pulled upward or backwards. If you've chosen clips, combs or panels of stretch lace, remember that the stretch lace and combs can be seen if you part your hair close or through those areas - and can make certain hairstyles difficult to achieve (half up, half down style, canerows, pigtails and so on). Any stretch lace may be visible if the hair is worn with a parting that runs across the panel. The development of different cap constructions for full lace cap wigs has been a somewhat slow burning affair but the growing popularity of lace wigs has sparked the development of different cap styles. 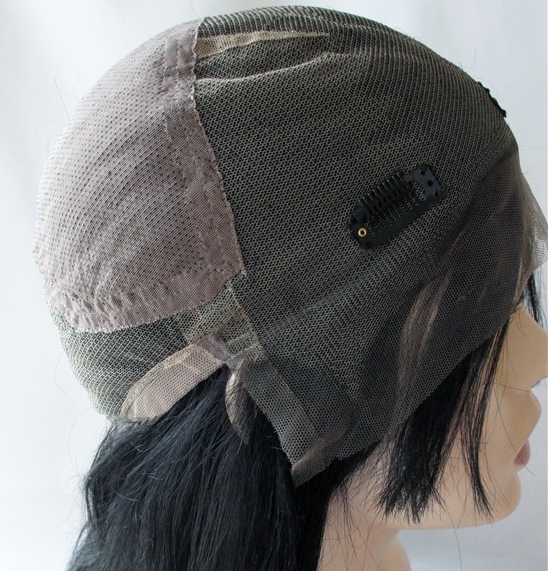 It's easy to be enticed into all sorts of options for your full lace wig cap construction, without really knowing whether you need (or even want) to go the whole hog with accessories. The TCPG Top Tip for finding your way through the thicket of full lace wig cap designs is to decide: what it is you need, what it is you want and then choose your full lace wig cap construction; after all, it's going to be the hair that you wear.